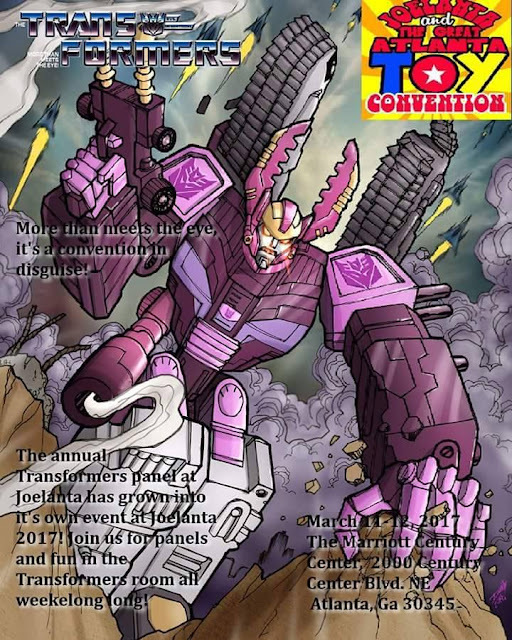 For the past few years, I've been helping operate the annual Transformers panel at Joelanta here in Atlanta. It's been a ton of fun and thanks to it's success, it's grown into it's own event within the convention. This year (2017) the Transformers panel has changed into it's own series of panels in it's own dedicated space. The planning for the event has been fun and the closer it gets, the more excited for it I get. Joelanta is a wonderful convention in it's own right. It's this amazing nirvana of toys and fun that just can't be replicated. The annual parachute drop is probably my favorite event. Just imagine throwing action figures in parachutes off the balcony of a very tall hotel and you've nailed exactly what it is. Pure fun and a little crazy. I'm also looking forward to the trading party on Friday. Last year I traded a giant ziplock bag full of tiny monster toys for a Green Goblin. I kinda want to take him back and see what I can swap him for. Just see if I can keep it going and see what I get each year.